It was wonderful to travel down to the Foundling Museum in early February to meet my object. On the train I read ‘H is for Hawk’ by Helen Macdonald: a searing account of grief, shock, the loss of a parent and a childhood landscape. My journey wound through misty, frosty Breckland forests opening out to suburban centres. It felt fitting to arrive at an historical building focussing on difficult familial circumstances. The Foundling Museum struck me as outwardly calm, grand, institutional, and reassuring in its solidity. Its values were evident in the space and structure of the place. But the tiny details of tokens left by the mothers to identify their children looked fragile, haunted, desperate. Crimpled scraps of clothing, frayed and faded ribbons, bottle tops and ceramic buttons. Women were central to this place in that they gave their children up to it, in a difficult balance of loss, gift and abandonment. But set up by men, it was their impressive portraits that dominated the walls. I wanted to connect to the women, and the children. I came to think of it as the museum of absent mothers. When I discovered I was paired with the staircase I was delighted but a bit wary. Delighted because it’s such a beautiful, tough object. Wary because staircases are horribly metaphorical. They connect and separate; evoke hidden structures in society; are solid and authoritarian, but somewhere children play and hide, perhaps listening to the closed world of adult discussion below. I didn’t want my writing to hover above the artefact, but bring it to life. 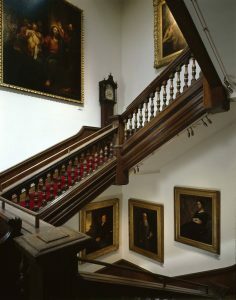 I realised that like most people I’d traipsed up and down looking at the portraits ornamenting the stairwell; I’d not really taken any notice of the actual stairs. I ran my hand along the worn, ridged surface, as the children must have done. I took a pencil rubbing of the grain to connect with its warm rivulets of oak. A thought that kept coming back was the way wood vibrates with sound. I recalled an article suggesting walls structurally remember sounds that reverberate through them. This staircase would have captured so many years of yells, calls, whispers, as well as the daily pounding of feet, soft treads, scuttles and scuffles. I asked the museum for more details – where did the oak originate from, who carved it, who installed it, who moved it to its new place? Surprisingly little was known. So the staircase was in its own way a foundling – parentless, raised in the institution, standing on its own two feet. I wanted to give it a voice and personal history. Something of a child’s resilience entered the staircase. I mulled on it for a while, and the first stanza formed while driving. I played with the middle stanzas, aiming to bring out the daily detail of the staircase and its imagined life. The title came quickly, and for me plays two roles. It signals the staircase has its own voice. And it’s an anglicised version of the French saying ‘l’esprit de l’escalier’: when you remember too late something you should have said. The last line was the last to come, after a couple of weeks’ tinkering. When it landed, it seemed to draw all the elements together, while still allowing room for further thoughts to take flight at the end of the piece. who had to break to leave me here. scuffed this lustre in my tread. our mothers might have said.